No one likes to have a stuffy nose but often during different times of the year, especially during allergy season, many are prone to have this problem. For others, this is a chronic condition. Nasal stuffiness can be quite uncomfortable and in addition to the feeling of increased pressure in your nose and sinuses, it interferes with the amount of oxygen you are able to breathe into your lungs. While mouth breathing is of course the next option, chronic mouth breathing decreases the amount of oxygen you absorb. It also can lead to conditions such as sleep apnea, snoring and even to high blood pressure and heart conditions. A mouth breather usually does not sleep as well and wakes up feeling tired. According to Medline Plus, a stuffy nose or nasal congestion occurs when the tissues that line in the nose become swollen. The swelling is due to inflamed blood vessels. 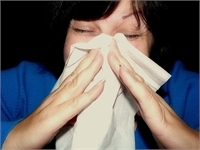 Causes of stuffy nose can include head colds, flu, allergies, hay fever and sinus infection. Saline spray will help loosen mucous as well as keep the nasal passages moist. Drug stores sell saline nasal sprays but you can save money by making your own. All you need to do is put ¼ teaspoon of salt into a cup of boiled water or distilled water. After it cools, put it into a small plastic spray bottle. Spray 3-4 sprays in each nostril while inhaling and repeat as needed. If you don’t have a spray bottle handy, you can use an eye dropper and put several drops into each nostril as needed. Nasal stuffiness can be helped by adding moisture to the air in the room. The ideal level of humidity in your room should be between 35 to 50%. You can use a humidifier to achieve this. Run the humidifier daily and just refill it as needed. The fan in the humidifier blows a fine mist of moisture into the air. Humidifiers require a filter, (preferably a HEPA filter). Be sure to replace the filter as needed. Onions are good decongestant as well. Onions fumes are known to be an irritant to the lining of the nose and will cause the nose to drain. Take a slice of onion and inhale it for several minutes at a time. Oil of eucalyptus is well known as an effective treatment for opening nasal passages. One of the best ways to benefit from it is to put several drops of eucalyptus oil into a pot of boiling water. Make a towel tent by draping a towel over your head and position yourself forward so that your face is leaning over the pot. The steam from the pot should be concentrated in your nasal area. Let the steam work for about fifteen minutes. Oil of Eucalyptus has a fairly long shelf life of about 2 years. Keep it stored in a dark bottle. Taking a hot steam bath or a hot shower is good for giving relief to your stuffy nose. The principle again is to increase the moisture in the air and allow the nasal passages to become moist. The hot steam also lossens the mucous, making it easier to expel. Chronic nasal stuffiness can be caused by structural conditions in the nose, nasal deformities or enlarged adenoids and should be evaluated by a physician.